Morgan is a 13 year old boy with DejerineSottas, he has been at main stream school, all his school life, and has found it difficult to fit it to P.E. Morgan loves sport, any sport, he will have a go. When he was in his 2nd to last year of middle school, I asked his teacher for help as I had been unsuccessfully trying to find clubs who would take a disabled child. His teacher found a club which had just started up called STARS. It was run by a lovely lady called Sandy Fell. It was with other disabled children, Morgan felt part of a group, and made friends very quickly, he gained confidence. I had to wait in the car, so he could go in on his own. Sandy told us about SWB (formally SADG), and what they did. The next day I went back to school, and told them all about SWB, and we have not looked back. Morgan and his classmates went to every event that year and they all grew with confidence. The smiles on their faces during each event and especially if they won was fantastic. At one of these events, Morgan was asked to come along to a racing wheelchair club, in Worthing. He took to it like a duck to water. Morgan has only been going wheelchair racing for a year, and he has already been picked up by the Weir Archer Academy. He trains Mondays, Wednesdays and Saturdays at Weir Archer (Kingston), and Tuesdays at his old club in Worthing. 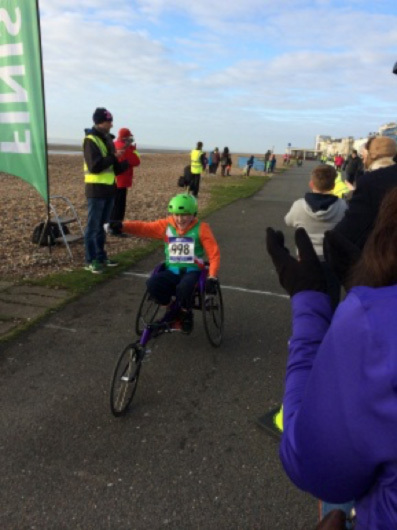 He has done many races, Worthing 1k, BUPA 1 mile, London 1 mile, etc which he has done by borrowing a racing wheelchair, (which is to big for him) he is soon to get his own. The London mile, Morgan was the first Man/boy over the line. Morgan is ranked 10th in Great Britain. From doing no sports he is now being trained by the best Paralympic Coach, Jenny Archer, the coach of Paralympian David Weir. She predicts great things for him. His journey would never have started if it was not for Sandy Fell and the efforts of all of the team involved with SWB.